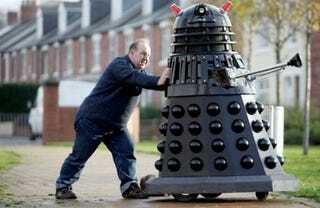 At least he should have nice muscles after pushing his Dalek around all day. Built for around $1,149, this full-sized Dalek uses an electric wheelchair as its base, and in addition to pushing, can also be controlled via remote. While master Rob Bosher is a far cry from David Tennant, he's built in a voice modulator so his creation doesn't just look like a Dalek and walk like one, it also talks like one too.